Peace poles are reminders of what can be. The Peace Pole Project started in Japan in 1955 by Masahisa Goi, who decided to dedicate his life to spreading the message, “May Peace Prevail on Earth” in response to the bombings on Hiroshima and Nagasaki. Mr. Goi believed that Peace begins in the heart and mind of each of us, that peace comes with thoughts of Peace. Peace Poles are reminders us to keep Peace in our hearts and our thoughts and as we do so, Peace will gradually become a natural way of life. We become peace. Peace-lovers from everywhere have been involved in Peace Pole dedications, including the Dalai Lama, Mother Teresa, President Jimmy Carter, and Deepak Chopra. 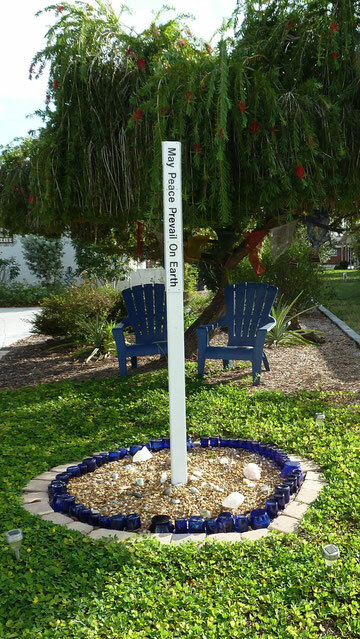 There are peace poles all across the US and the world at homes, schools, and places of worship. There are now over 200,000 Peace Poles around the world in over 190 countries!